Haile Plantation is a 1700 acre premier mixed-use urban development offering a Gary Player’s Golf Course, a top-notch country club, pools, and state of the art tennis courts, including over 15 miles of running and jogging trails connecting to the Archer Braid Trail in the SW corridor of Gainesville Fl in Alachua County and to the various named subdivisions within the main community. Its namesake stems from a North Central Florida Sea Island cotton plantation owned by Thomas and Esther Evans, whose historic homestead still stands in Kanapaha Plantation. Nonetheless, the true creators of Haile were the original developers, Bob Kramer, Matthew Kaskel, and Realtor Bob Rowe. Their vision was to create an integrated mixture of diverse price points revolving around a commercial space with apartments above offices; retail where neighbors were connected by trails, open spaces, and parks to create a close-knit community. The Haile Village Center is the main the focus of the community, consisting of the 2-story commercial and residential mixed development with a variety of specialty shops, award-winning restaurants, retail, and healthcare, law, real estate, and other offices. In addition to the standing shops, every Saturday from 7am-12pm, local farmers, artisans, chefs, baristas and shop owners organize to sell their fares at one of the most well known Farmer’s Markets in Alachua County. Shoppers have the opportunity to purchase locally grown potted and fresh cut flowers, bushes, trees, fruits, vegetables and more. 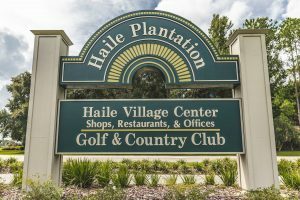 The Haile Village is where you want to be as a Haile Resident or visitor; if you’re curious as to what there is to do here, this is our top 10 list! Haile Village Spa and Salon is the ultimate luxury experience. Treat yo-self to any one of their services including massage, waxing, facials, hair, and nail services. They are an avid exclusive, cruelty-free salon, so you can indulge in relaxation without any guilt! Their technicians are truly artists, and you can book online! Our guilty pleasure: sneaking over and getting a manicure on our lunch break! A next level “pawn boutique,” this is not what comes to mind when you think of a pawn shop. Their interior is stunning, their service is friendly, and their purpose is to fulfill the designer shopping needs that just aren’t usually met in Gainesville. Tired of traveling to the major cities to fulfill shopping needs, Clint and Sheena created a place that specializes in fine jewelry, handbags, and accessories. It’s worth a browse next time you’re wandering around the village. 5323 Southwest 91 Terrace, Gainesville, FL 32608. This is Gainesville’s only Traditional British Pub, where you can find well-made classics such as Bangers and Mash, Fish and Chips, and Scottish Eggs, along with a full delicious menu. At the bar, they serve Boddingtons and Guinness on tap, with Football (or as we Americans call it, Soccer) playing on the screens.On Saturday night you can sing Karaoke with DJ Mike, listen to live music and attend British inspired celebrations. Owners Jayne and Abbas are always welcoming. This Pub is attached to The Haile Bistro with the same British and Persian menu, plus Abbas’s delicious desserts, coffee, and teas. 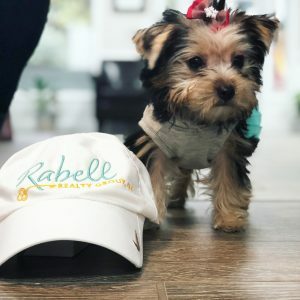 The sweetest little doggie shop in town where you can wash your pup in their self-service shower, buy homemade cakes and other treats, or use Ms. Pat and Colleen’s doggie daycare service knowing they are loved just like if they are at home. These ladies also have a wonderful assortment of harnesses, leashes, collars, beds, and more. So technically this isn’t in the village, but it’s such a beautiful spot we couldn’t leave it off the list. The Kanapaha Botanical Gardens is a whopping 62 acres featuring Florida’s largest bamboo garden and the largest herb garden in the Southeast. Even if horticulture isn’t your thing, it’s the perfect place for a picnic date, creative photography session, or just to learn more about nature! They host many events as well, the most notable being the Moonlit Walk, when the paths are illuminated at night, dogs are allowed in the gardens on leashes, and live music is featured. Like their page on facebook to keep up to date on their special events! 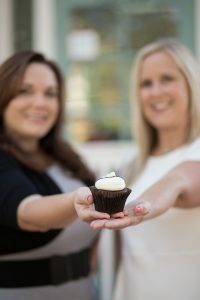 Who doesn’t love CUPCAKES! Not to mention, the best cupcakes in Gainesville, hands down. Top that off with great coffee, other bakery items, they tastiest quiches bites, sandwiches, and even ice cream! Jan runs a delicious bakery with a wonderful atmosphere where you can sit at the tables outside or enjoy the spaces inside for small meetings, visiting with a friend or two, or just enjoying the sweets at an alone time. We stop in nearly every morning to grab a cup of coffee before work. Try their pumpkin spice! If you need ANY type of gift, this is where you go. From local artisans, specialty wines, stationary, candles, frames, jewelry, Gator paraphernalia, fine chocolates, and snacks in the fridge Ms.Sara stocks it all. Perfect gifts for any occasion, or just to surprise someone with a little extra random kindness. If you like award-winning sushi, you have to come to the Haile Village to indulge in their gorgeous rolls and delicious menu. A repeat winner Greater Gainesville Iron Chef Competition is only one of the many accolades the amazing chefs and waitstaff. Sit out front and enjoy the views of Haile Village, and the fall breeze. 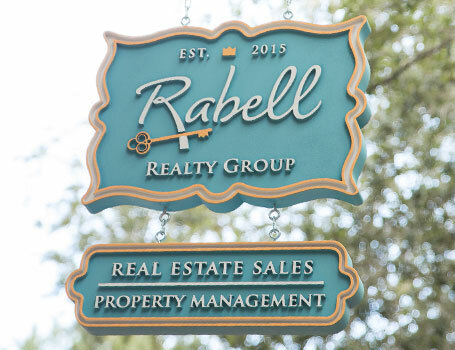 Self-love moment: Rabell Realty Group is the best small business on the block! From our silly signs out front often featuring the latest meme trends to the stunning interior, our office is the place to be. When you walk in the front door you’re greeted by our friendly staff, the realtors working at our gorgeous long table, and probably whatever assortment of baked goods have been brought by that week. There’s music, there’s family – we’re a tight-knit group that loves the community. Walkthrough on Oktoberfest, or Light the Village, and see for yourself!